Finally dessert, I did not go super healthy, but I thought since I served a fruit tart it could go under a very large umbrella of healthy. This recipe came Thomas Keller’s Bouchon Bakery cookbook. I love his cookbooks, they are beautiful and so educational in how he explains all of his steps. Each of his books I own truly inspire me when I flip through them from time to time. In a separate bowl, mix the butter with a paddle attachment and cream together till it has the consistency of mayonnaise. Sift the remaining powdered sugar and mix for 1 minute, until fluffy. Add the dry ingredients in 2 additions, mixing for 15-30 seconds after each or until combined. Scrape down the sides and add the eggs and mix on low speed until just combined 15-30 seconds. Transfer dough to surface and work it together. Divide the dough into two equal portions and form a 4×6 inch rectangle, about 3/4 inch . Wrap in plastic wrap and refrigerate until firm about 2 hours, but preferably overnight. Can be frozen up to 1 month. Sift the almond flour and flour in a bowl and whisk together. In a standing mixing mix the butter until the consistency of mayonnaise and sift in powdered sugar. Beat until fluffy about 2-3 minutes. Scrape down the sides and add the almond mixture and mix on low for 30 seconds. Add the eggs and mix on low until smooth. Out cream into a container and place a piece of plastic wrap on the cream to prevent skin form forming. Refrigerate until cook or up to 4 days. Before using bring to room temperature. Place dough between two pieces of parchment paper and roll out dough to be inserted into and 8 by 3/4 inch tart ring. ( I used a 9 inch tart ring) Once rolled to desired size take top layer of parchment paper off and flip the dough inside the tart ring. Now Thomas Keller says to use a pastry bag to pipe in the almond cream, but I skipped that step and evenly spread it inside the tart shell. Then arrange the plum wedges on top of the cream. You want it to be very full as the fruit shrinks when baking. Bake for 45 minute until the crust is well browned. Let cool completely before serving. 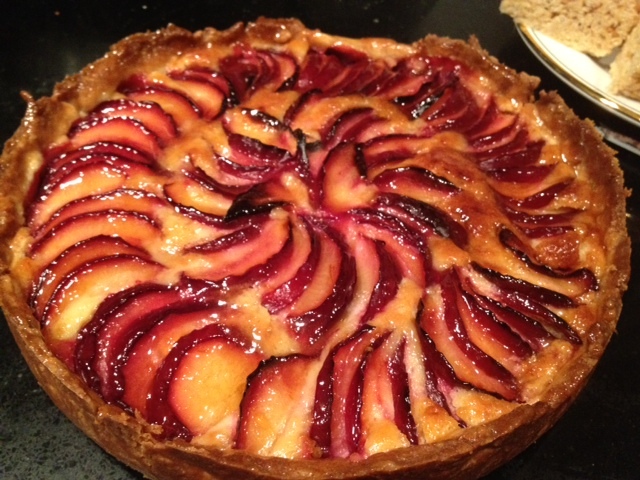 To finish- I heated 2 Tablespoons of Plum Jelly until in a liquid state and brushed the top of the tart.